We're going to end our Civil War discussion with a topic that will assuredly make people angry at me. And while the Civil War was a vitriolic part of American History, this only seems fitting. 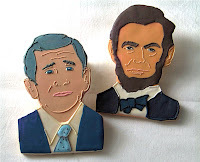 I don't believe that you can hate George W. Bush and still like Abraham Lincoln. Let me explain. For example, Lincoln completely ignored habeas corpus laws as President in order to imprison his opposition unjustifiably. When, I told this to my friend, not a Bush fan, his rational was, "Well, Lincoln was involved in a war at the time." I guess he contends that we are not. And therefore the Patriot Act and other executive power-wielding by this administration is unjustified. Or, is it because of the fact that Lincoln won, whereby we give him the benefit of the doubt? If Bush had won this war two years ago, would we ignore his executive slightings of civil liberties because of the greater good that was accomplished? We shouldn't. But, it seems like, in history, the end justifies the means. Because slavery was eventually abolished, Lincoln is a hero. Not because the confederacy had the constitutional right to secede from the Union. Not because he used a militia force to attack his own people. Not because he used tyrannical power to ignore civil liberties and achieve his goals. Not because the Emancipation Proclamation didn't free all slaves, but only slaves in confederate states. But, because a result of the Civil War was the abolition of slavery, Lincoln is widely deemed our greatest President.